Last Friday I made this recipe, which I’d originally seen on America’s Test Kitchen on PBS, and it was awesome. I just wanted simple, good food and this fit the bill. A great Friday night meal. 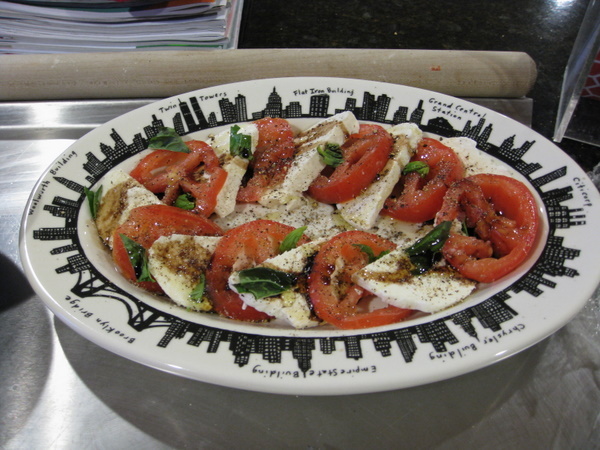 I served it with some crusty bread and a really great caprese salad. Whole Foods is starting to get some flavorful tomatoes in again. They always have tomatoes, they just taste better in spring and summer. Really good in summer, but these tomatoes were pretty good. And they always have excellent mozzarella made locally. I used my tangerine balsamic and meyer lemon olive oil from Carter & Cavero. 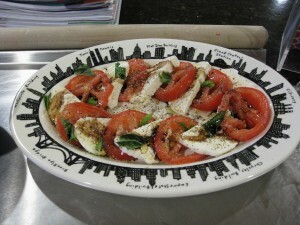 So good, we couldn’t get over how good the caprese is now that spring is here. And then there’s the main event. 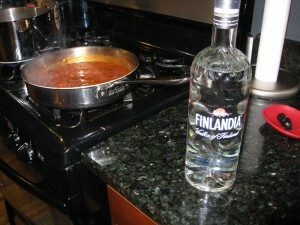 We used Finlandia vodka because the show suggested using the best quality vodka you have available. The flavor really makes a difference, apparently, and this was delicious. 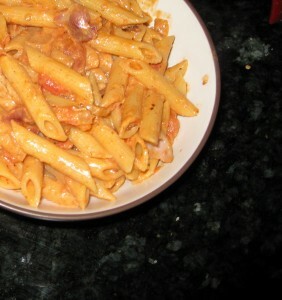 So that the sauce and pasta finish cooking at the same time, drop the pasta into boiling water just after adding the vodka to the sauce. 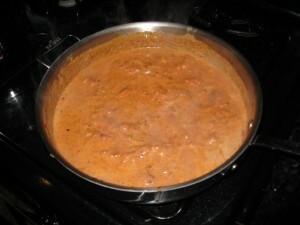 If possible, use premium vodka; inexpensive brands will taste harsh in this sauce. Pepper vodka imparts a pleasant flavor and can be substituted for plain. 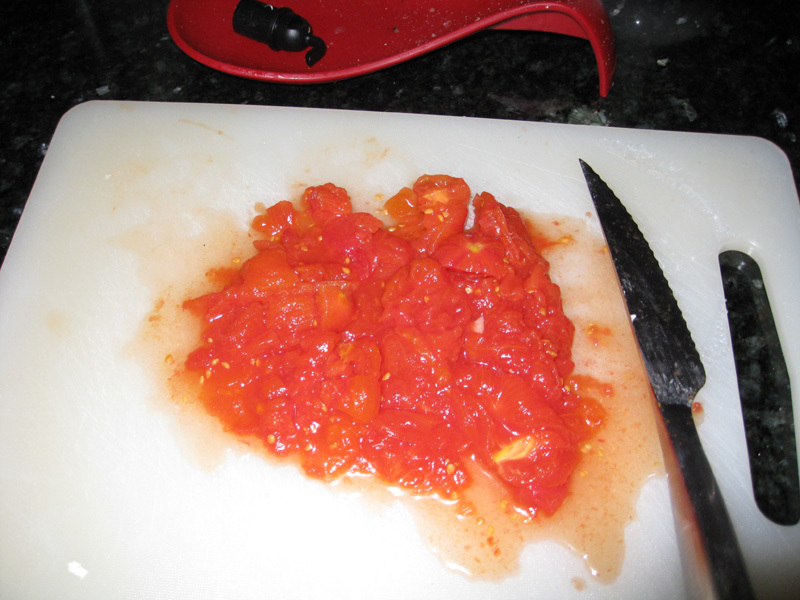 Puree half of tomatoes in food processor until smooth. Dice remaining tomatoes into 1/2-inch pieces, discarding cores. Combine pureed and diced tomatoes in liquid measuring cup (you should have about 1 2/3 cups). Add reserved liquid to equal 2 cups. 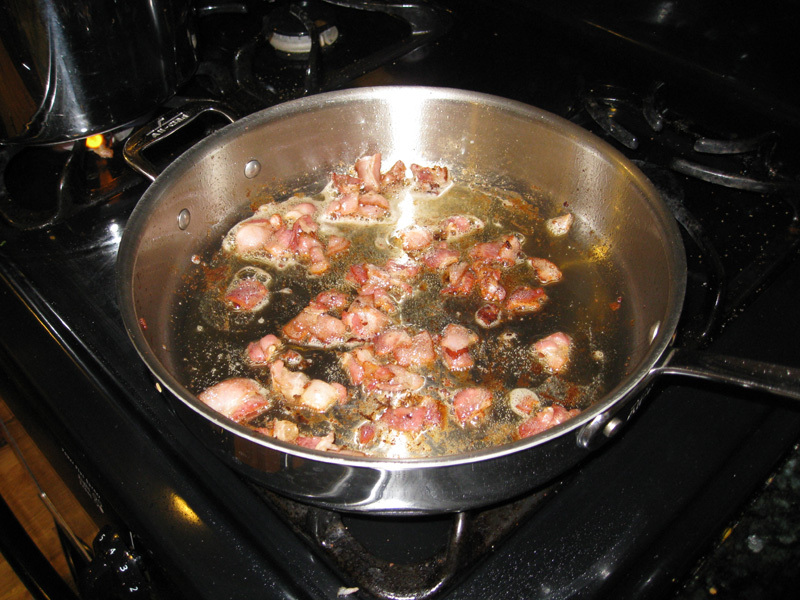 Heat oil in large saucepan over medium heat until shimmering, add pancetta and cook until crisp, 6 to 8 minutes. Using slotted spoon, transfer pancetta to small bowl and set aside. 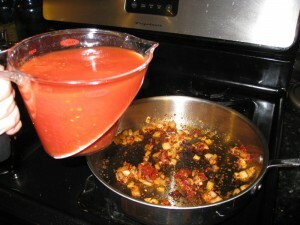 Pour off all but 2 tablespoons fat from the pan. 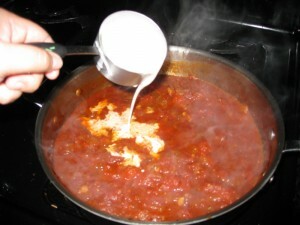 Add onion and tomato paste and cook, stirring occasionally, until onions are light golden around edges, about 3 minutes. Add garlic and pepper flakes; cook, stirring constantly, until fragrant, about 30 seconds. 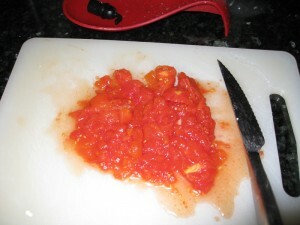 Stir in tomatoes and pinch of salt. Remove pan from heat and add vodka. 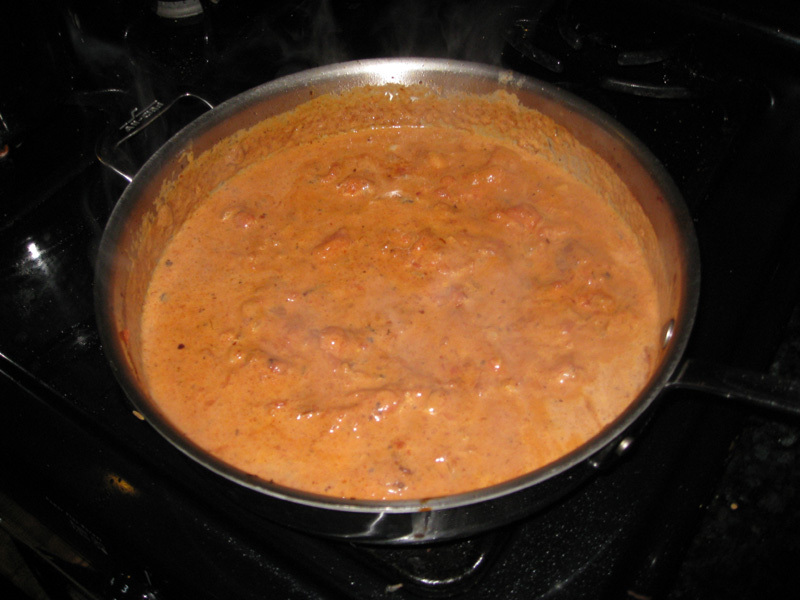 Return pan to medium-high heat and simmer briskly until alcohol flavor is cooked off, 8 to 10 minutes; stir frequently and lower heat to medium if simmering becomes too vigorous. Stir in cream and cook until hot, about 1 minute. Meanwhile, bring 4 quarts water to boil in large Dutch oven over high heat. 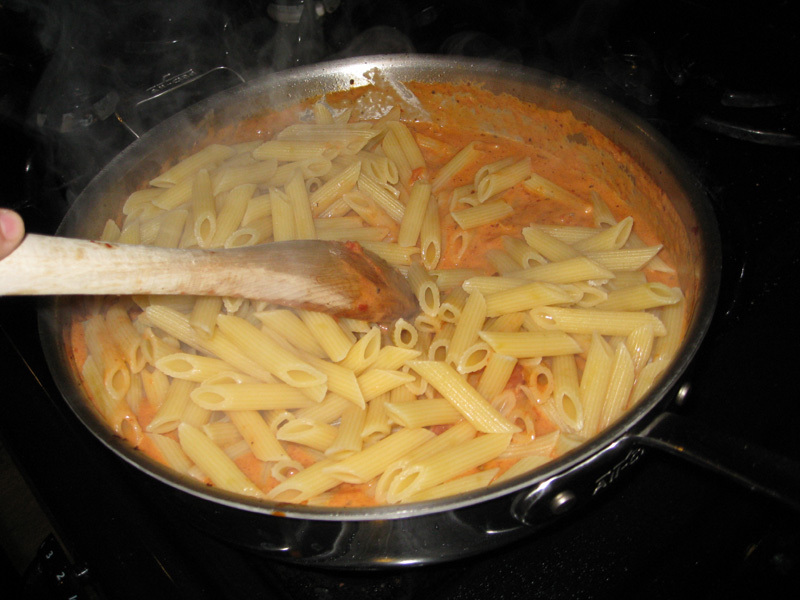 Add 1 tablespoon salt and pasta. Cook until just shy of al dente, then drain pasta, reserving 1/4 cup cooking water, and transfer pasta back to Dutch oven. Add sauce to pasta and toss over medium heat until pasta absorbs some of sauce, 1 to 2 minutes, adding reserved cooking water if sauce is too thick. 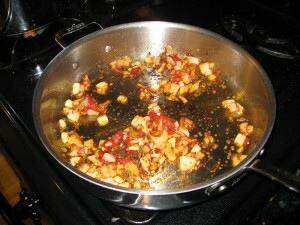 Stir in basil and reserved pancetta and adjust seasoning with salt. Divide among pasta bowls and serve immediately, passing Parmesan separately.